Ceramic bearings are typically constructed with a ferrous inner and outer ring or race with ceramic balls in the place of steel. Ceramic bearings offer many advantages over all-steel bearings, such as higher speed and acceleration capability, increased stiffness, lower friction and more. Ceramic balls are also nonconductive. 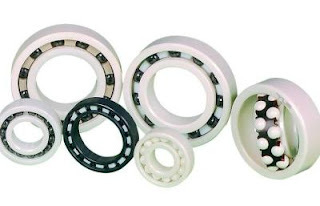 Ceramic bearings are available in all standard industry configurations such as angular bearings, thrust bearing, pillow block bearing, needle bearings, and roller bearings. Ceramic bearings balls are typically made from (Si3N4) ceramic silicon nitride and have a greater hardness than steel balls resulting in longer ball life. Ceramic bearing balls have smoother surface finishes than most steel bearing balls. Thermal properties are also better steel balls which result in less heat generation due to friction at high speeds. To manufacture an extra fine surface finish on ceramic balls, the balls are elevated with a magnetic field and then polished with plasma stream. Ceramic bearings balls are rated at higher spin rates than steel bearing balls. Ceramic bearing balls can weigh up to 40% less than steel ones, depending on size and material. This reduces centrifugal loading and skidding so hybrid ceramic bearings can operate 20% to 40% faster than conventional bearings. This means that the outer race groove exerts less force inward against the ball as the bearing spins. This reduction in force reduces the friction and rolling resistance. The lighter balls allow the bearing to spin faster and uses less energy to maintain its speed. While ceramic hybrid bearings use ceramic balls in place of steel ones, they are constructed with steel inner and outer rings; hence the hybrid designation. While the ceramic material itself is stronger than steel, it is also stiffer, which results in increased stresses on the rings, and hence decreased load capacity. Ceramic balls are electrically insulating, which can prevent 'arcing' failures if current should be passed through the bearing. Ceramic balls can also be effective in environments where lubrication may not be available (such as in space applications). Ceramic bearing balls require less lubricant and exhibit less lubrication degradation, which results in increased bearing life. Ceramic bearings manufactured from Si3N4 can operate at temperatures up to 1600F. Ceramics also are resistant to oxidation. High-temperature applications, friction, high speed, aircraft accessory, semiconductor and food processing, dental handpiece turbines. Many high-speed electric motors requiring voltage isolation use ceramic material bearings.